Photo: Children at our rural primary school are happy to have uniforms, school supplies, and loving teachers in their remote village near the Kenya border. Previously they had to walk several miles to reach a government school in a neighboring village. Today we bring you an important update from our native team in Uganda. We are seeking to make some improvements to our rural primary school in Mairinya so that it can remain in operation, offering a quality education to the 250 children who are currently enrolled. The Ministry of Education in Uganda is starting to become more strict and we run the risk of not being able to operate the school if we don’t meet their new requirements for accreditation. These requirements are late-breaking announcements from the education board; previously they did not monitor schools in remote rural areas such as Mairinya. With your support, we are seeking to meet the new governmental requirements by purchasing 100 more desks, hiring more trained teachers, building administrative offices, fully furnishing our classrooms, and purchasing more learning aids such as books, notes, charts, diagrams, and computers. Previously, there had never been a school in this village — we are the first one in the area. We opened it in 2012 with what little resources we had at the time. As our main campus high school had required the bulk of our financial and administrative focus at the time, we were not able to properly equip the school and could only afford to build a rudimentary shelter with 3 classrooms. But we knew we needed to start somewhere because we felt that access to education, no matter how basic, was critical for the children of Mairinya. 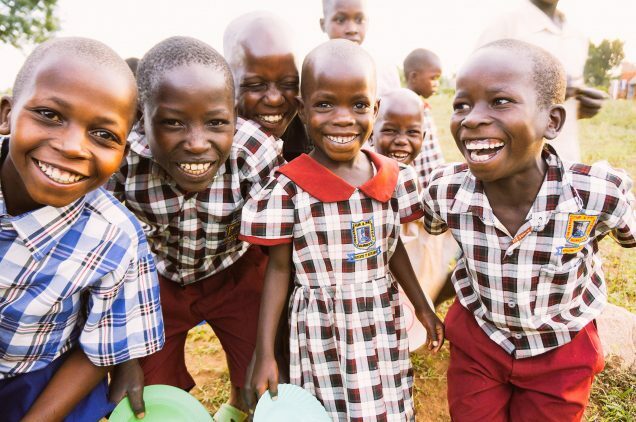 Photo inset: (Top-left): Children at our rural primary school are happy to have a place to learn which has concrete floors, a strong roof, and large chalkboards, a rarity in rural Ugandan schools. (Top-right): Our native team prepares hundreds of meals per day for children in need. 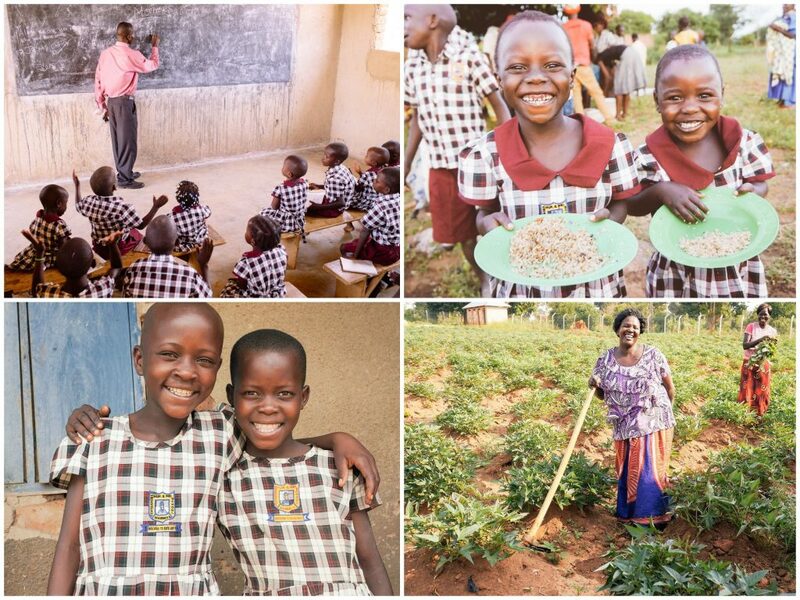 (Bottom-left): 250 children are currently enrolled at our school located in a remote village near the Kenya border; ours is the first one in the area. (Bottom-right): Our Uganda team members are happy to report a bountiful harvest of potatoes despite a recent severe drought. Then in 2014 we received a generous $40,000 gift for a permanent, storm-proof school building along with additional land for future expansion. The children have enjoyed the new building immensely, especially for its concrete floors and strong roof. Their old facility had only dirt floors which would turn to mud anytime it rained. The new classrooms also feature large chalkboards which are built into the walls; quite a rare sight in rural Ugandan schools. Many schools in this region meet under trees where the chalkboard is severely weathered and simply nailed onto the trunk of the tree. We have come a long way in educating our children in Mairinya, and we are so thankful for your generosity which will enable us to meet the governmental accreditation requirements, thus keeping our primary school in operation, furthering the children’s education. In other news, there has been a severe drought in the area since spring 2016, and it intensified during the summer. The drought affected the yield and variety of our crops, and the prices of food spiked nearly 30 percent, which has challenged us when buying food at the local markets. But we are happy to report that since we are located near the lake Victoria shores where it stays wet, we were able to grow potatoes during this difficult time. Over the past 9 months we were able to realize several bountiful harvests exceeding 1 ton of potatoes. We are thankful for this nutritious provision, but with your generous support we are seeking to raise $7,000 to restock food staples for our students and staff for our high school and rural primary school, such as beans, rice, and corn, from which we make corn flour, locally known as posho. These foods store well and we count on them to prepare several hundred meals daily. Pray with us for the rains to return so that our own farmland can provide much of these needs in the year ahead. As always, we are grateful for your prayers and faithful support, enriching the lives of our children, and giving them a hopeful future.